With a customisable LED lightshow and clear 360 degree sound, the JBL Pulse 3 Portable Bluetooth Speaker is the perfect speaker to start your party either day or night. With the JBL Pulse 3 Portable Bluetooth Speaker you can connect up to 2 smartphones or tablets at a time, allowing you to switch between playlists and music styles at will. 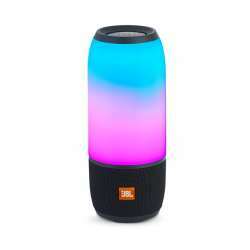 The JBL Pulse 3 Portable Bluetooth Speaker uses a customisable 360 degree lightshow to bring colour and life to your party, heightening the atmosphere in the process.